It is hard to overestimate the impact which World Youth Day – “JMJ2013” in its Portuguese translation — is having in Rio de Janeiro. Crowds of young pilgrims from across the world are spilling out from buses and underground trains and spreading out across the city in brightly-coloured themed T-shirts, many of them bearing the JMJ theme from Matthew’s Gospel – “Go and make disciples of all nations” – in different languages. Until the final Mass on 28 July no one can quite be sure how many pilgrims will come: so far 350,000 are registered, a clear majority (more than 200,000) of whom are Brazilian (Argentina and the US lead the numbers from other countries, followed by Chile, Italy, Venezuela, France, Paraguay, Peru and Mexico). But judging by previous WYDs, that number will treble or quadruple during the week, especially as more Brazilians show up. Despite numbers of Catholics shrinking in proportional terms over the last two decades, as Pentecostalism and agnosticism have grown sharply, this is still the world’s largest Catholic population at 123 million — 65 per cent of the population — and until very recently was growing in absolute terms (a recent Pew Forum study has up-to-date statistics.) Because the number of Brazilians has almost doubled in the last four decade, Catholics here, unlike Europe, are overwhelmingly young; how many of them decide this week to make their way to Rio will determine quite how massive the final numbers are. But it’s not just the scale of the events – 60,000 volunteers, 273 catechesis events in 26 languages, almost 8,000 priests, and 4m communion hosts – which has led to the accreditation of nearly 6,000 journalists, but the fact that Rio offers Pope Francis his first major global platform since his election on 13 March. 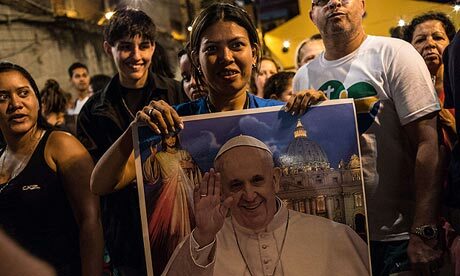 The first Latin-American pope, on his first foreign visit, to Latin America’s largest nation, addressing a massive assembly of young people, at a time of social ferment in the continent, cannot fail to make an impression. And even before he has opened his mouth here, his itinerary – which includes a visit to one of Rio’s many deprived areas, or favelas, as well as a visit to a prison for young offenders and a Church-run therapeutic centre for former addicts – has spoken volumes about the Church he wants to see, one that evangelises from the “periphery”, and that has a clear “option for the poor”. Some of the messages he will give this week will be directed at the world at large, exposing selfishness and indifference, and revealing God in active examples of Christian love and mercy. Others will be aimed at the Church as he summons Catholics to abandon their prilvileges and false securities in order to evangelise. No one will be exempt from his call to conversion. But there will be one group to which his message will be directed in particular – the “protagonists” of JMJ: the young. Pope Francis knows that being a Catholic in the west is increasingly counter-cultural, and that the growing popularity of World Youth Days is a way of escaping, for a while, the chill of secularism and basking in the warmth of a Catholic culture. 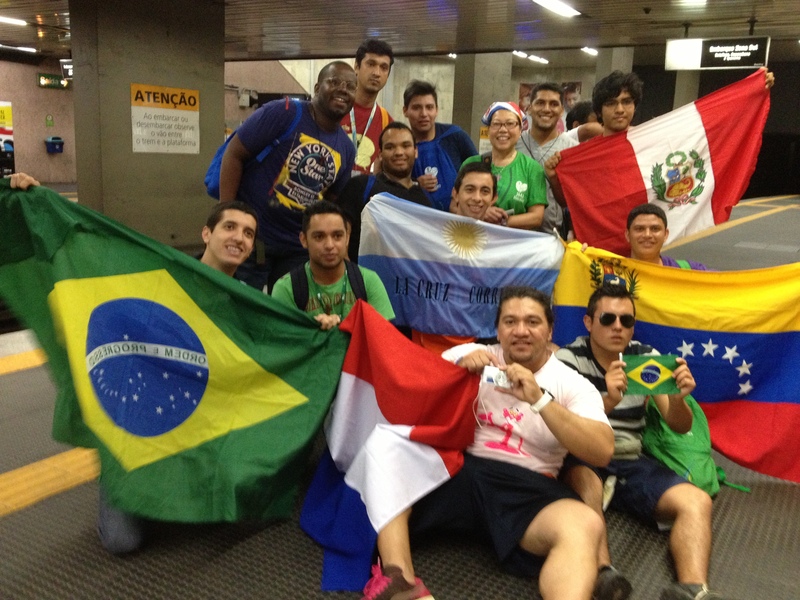 Many of the pilgrims arriving in Rio are WYD regulars, returning to recapture the Pentecostal experience of previous gatherings in Madrid, Sydney and Cologne; others – most of the Latin-Americans – are here for the first time, drawn by the reports of others. Knowing of the fruits of previous WYDs – above all in a renewal of vocations — Pope Francis will seek to edify them, challenge them, and encourage their calling. Judging by his record in Argentina – beginning with the two years he spent as a young Jesuit teaching in a school in Santa Fe – he will be prove an inspiring and demanding shepherd, with a natural affinity for the young. The Aparecida document is not a defensive document. If Catholics are leaving the Church and finding a spiritual home in Pentecostal communities, it is not the fault of those individual Catholics but of the Church. The Catholic Church must honestly ask herself what is missing in her presentation of the Gospel and the authentic, full living of the Gospel. Unless we are blatantly honest without our past errors, current malaise, lack of creativity and inability to connect with the modern world, and without a willingness to fill those gaps, we will continue to witness massive departures of the faithful from the Catholic Church. The old adage “build it and they will come” must be taken to heart. Because if we don’t build new structures and welcoming places, the people will simply go elsewhere, and those “elsewheres” are often not the most lifegiving places for our people. The antidotes to our pastoral failures are what the bishops gathered in Aparecida call the necessity of “permanent catechesis”: an ongoing encounter with the Lord Jesus, deepened spiritually through Word and Sacrament, the Bible and the Eucharist. Aparecida also re-commits the Church to an “option for the poor”: the defence of the weak, the denunciation of inequality and offences against the dignity of the person – abortion, war, human trafficking, drugs, terrorism, sexual exploitation. And it calls for the promotion of a “culture of honesty” which aims to heal the causes of violence and corruption, and a model of economic development which heals the planet and spreads of the benefits of growth more justly. This is a blueprint for the whole world, but particularly for Latin America. Brazil’s current unrest – there was a demonstration on Friday night in Rio, which brought part of the city to a halt – has exposed both the fragility of society (many of the protests have ended in vandalism and violence) as well as the birth of a new demand for greater government accountability. There are plans for protests on 26 and 27 July hoping to use the papal visit to draw attention to their (mostly unocussed) demands. As the New York Times reports, Pope Francis is likely to respond – as have the Brazilian bishops – sympathetically to their call for a more just society, while inviting the protesters to use peaceful and constructive means to build it. No one doubts that the “slum pope”, renowned for his humility, personal simplicity and closeness to the poor, will be credible in making this call. As in previous WYDs, there has been grumbling about the costs, and the use of public money to finance a religious event. But the figures themselves offer the most eloquent response. The Brazilian government is paying out an estimated $60 million in security and transport subsidies; by way of comparison, John Allen points out, it is spending a reported $13 billion on the World Cup. 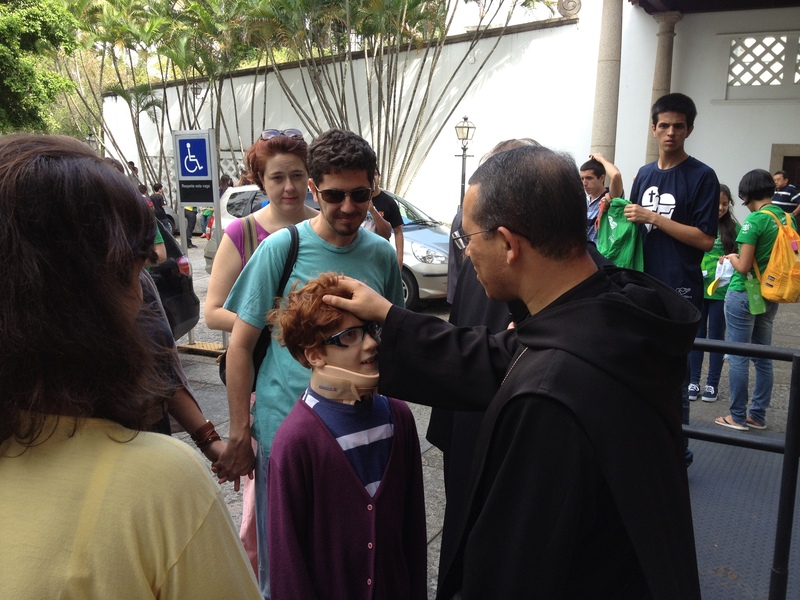 More than 70 per cent of costs of the JMJ overall are being met by the Brazilian Church through pilgrim subscriptions, merchandise sales, and donations by the ordinary faithful. 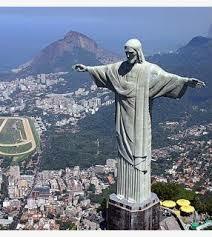 Meanwhile, Brazil’s Ministry of Tourism estimates JMJ’s benefit to the Brazilian economy to be more than $500m. Judging by previous WYDs, the investment will give a handsome return in terms of greater social solidarity. To take just one example: the people of the favela of Varginha, which Pope Francis will visit on Thursday, are hoping that their life will get better following Pope Francis’ visit, just as that of Vidigal did following that of Pope John Paul II in 1980. But mostly, the benefits will be far harder to calculate, and any predictions of how the week itself need to be kept in check — so much about JMJ2013 is unprecedented. Just as Rome is getting used to an entirely new style of papacy, so, too, will this year’s WYD. Monday 22nd. Pope arrives at 4pm, receives an official welcome from the Brazilian authorities, visits the President (Dilma Rousseff) and the municipal authorities, and retires to the Residencia do Sumaré, where John Paul II stayed on his two visits to Brazil (1980 and 1997). Tuesday 23rd. Pope rests. Afternoon: official opening Mass celebrated by the Archbishop of Rio de Janeiro. Wednesday 24th. Pope visits the shrine of Aparecida, says Mass, lunches with the Brazilian bishops, returns to Rio, and at 6.30pm visits the São Francisco hospital to inaugurate a new wing dedicated to recovery from drug addiction. Thursday 25th. Pope says private Mass, is given the keys to the city by Rio’s prefect, and at 11am visits the recently-pacified favela of Varginha. At 6pm, he greets the JMJ pilgrims on Copacabana beach. Friday 26th. Pope says private Mass, hears the Confession of some young people in the Quinta da Boa Vista, and at 1130 meets young offenders in the Archbishop’s Palace, where at 12 he prays the Angelus, gives a reflection from the balcony, then lunches with young people. 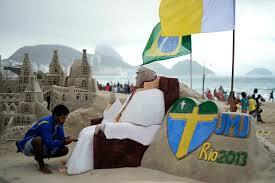 At 6pm he leads the Stations of the Cross at Copacabana beach. Saturday 27th. Pope celebrates Mass at 9 with the bishops, seminarians and religious in Rio cathedral, and preaches a homily. 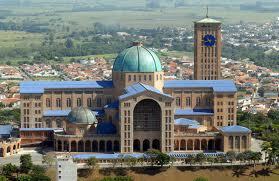 At 1130 he addresses Brazil’s civic and political leaders in the Municipal Theatre, before lunching with the bishops. At 7.30pm he leads the Prayer Vigil with young people at the Campus Fidei in Guaratiba, who will spend the night there. Sunday 28 July. Pope celebrates Mass at 10am in Campus Fidei, and later prays the Angelus. After lunch with the papal entourage back in the centre of Rio, he addresses the coordinating team of CELAM (the Latin-American bishops’ council). After meeting with JMJ volunteers, he is given an official send-off at the airport, leaving Rio at 7pm.